Somewhere is a travel-themed restaurant. 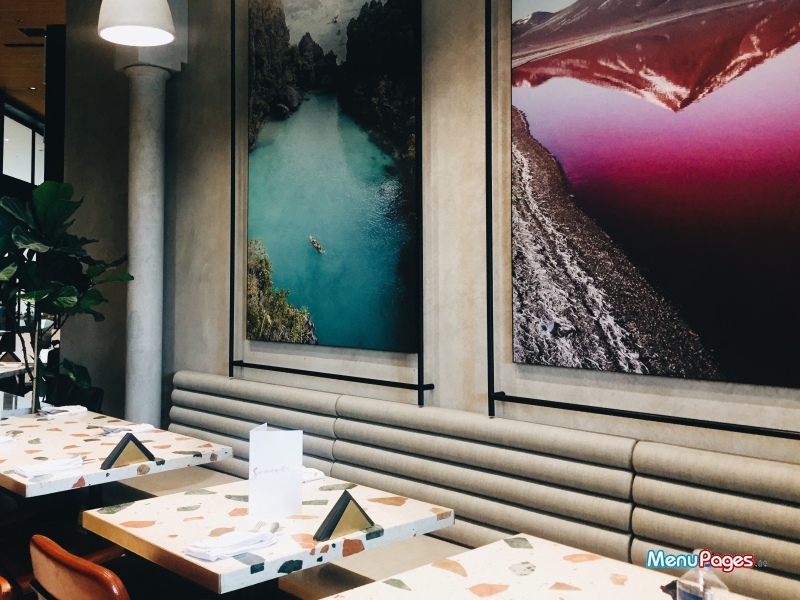 On paper, that conjures up mental images of plastic compasses hanging from the ceiling and a big, fat “wanderlust” sign demanding the room's attention. In classic Emirati style, Somewhere is crisp and modest, letting its understated vibe speak for itself. 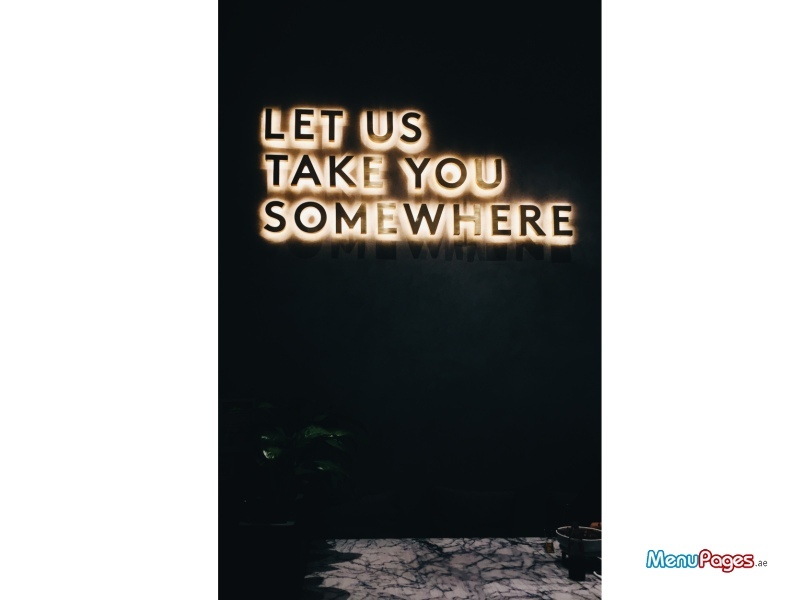 Serving third-culture dishes (Japan meets the Middle East with a chicken shawarma bao, Mexico meets the Middle East with the guacamole hummus, the Mediterranean meets the Middle East with the kunafa shrimp), book a ticket to Somewhere for a first-class flight to flavor town. Tables can be booked at 04 329 5182. Dubai Mall is a lot of things but it's not somewhere that will leave you hanging for a parking spot. Incorrectly thought to have the world's biggest parking lot (fun fact – Canada has the world's biggest parking lot), Dubai Mall's parking situation is in the running with over 14,000 spaces. We were greeted and offered seating outside the restaurant, inside and on the terrace. 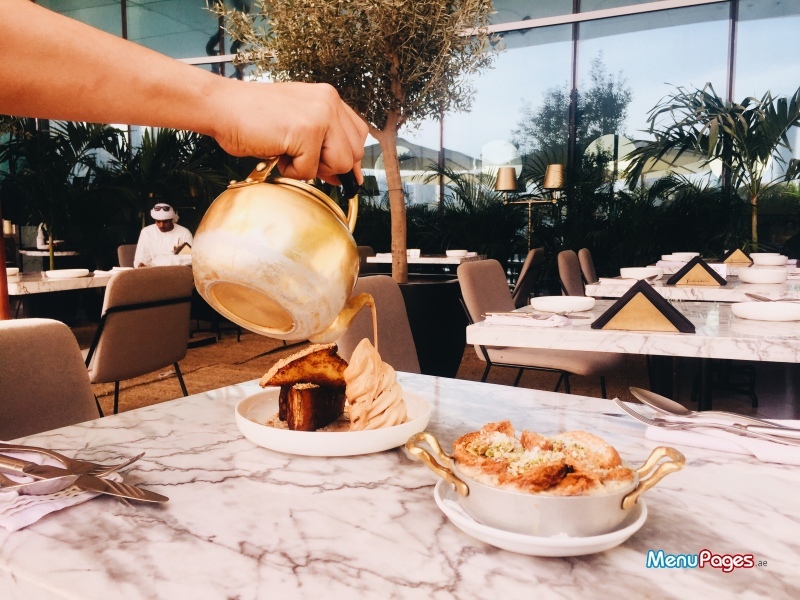 Wanting to indulge in a rare moment of Dubai winter sunshine – we grabbed a table on the balmy terrace. Somewhere's service is phenomenal. Dressed as contemporary Arabian sailors, the staff sailed around the restaurant, effortlessly catering to our whims. 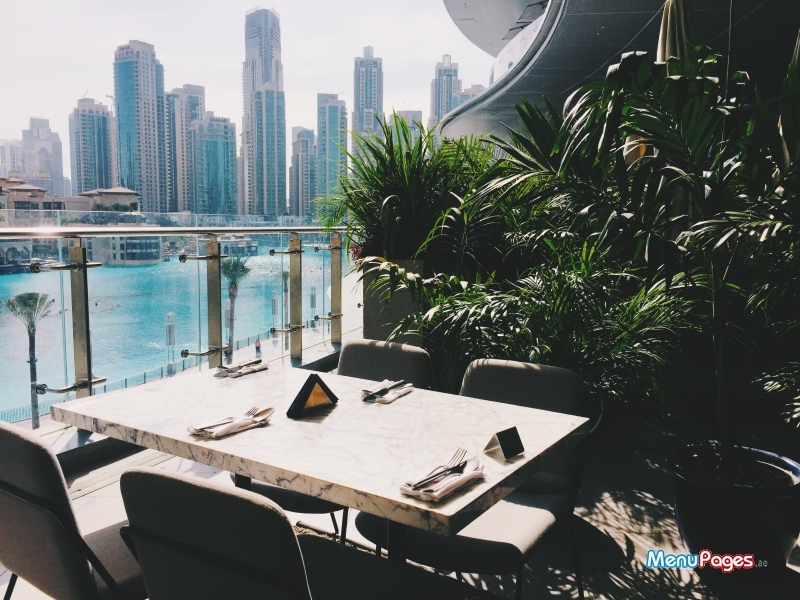 While parking and walking to the restaurant can take a lifetime (classic Dubai Mall problem), you can blaze through lunch and make it back to your desk just before your colleagues start to wonder where you are. Lunch was a lineup of Somewhere's menu superstars - batata harra fries, lime corn salad, chicken shawarma baos, fish sayadieh, karak french toast, cerelac umm ali and an espresso. We worked through a bowl of batata harra fries while perusing the menu. 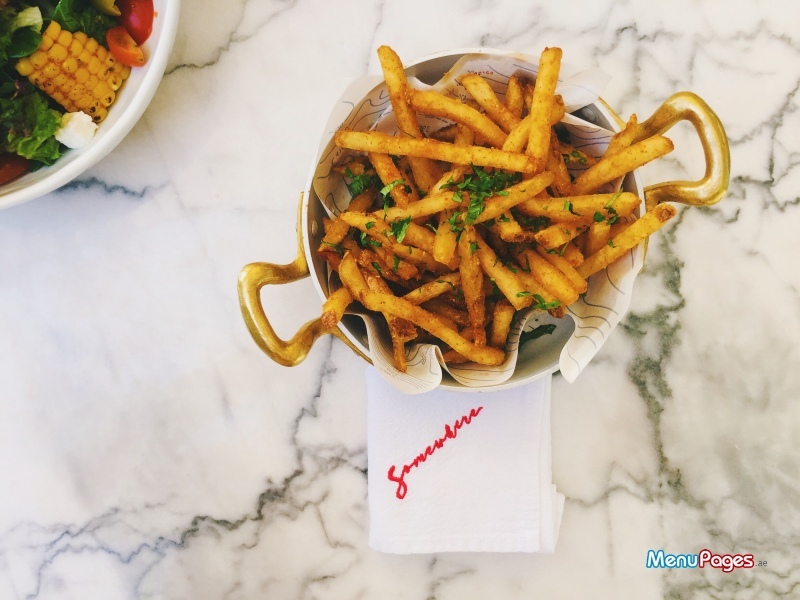 One of Somewhere's signature dishes, these generously spiced fries deserve their position in the spotlight. January's fitness resolutions got blurrier with every fry we tucked into our mouth, so to balance our meal, we ordered the lime corn salad (also a best-selling dish). Once it arrived, we were left confused about why it was widely loved and why it cost what it did. A disappointment from the first bite, this salad was just a pile of leaves with literally four strips of corn scattered around the bowl. It needed redemption in the flavor department and we'd advise against ordering this. Our sagging mood was instantly uplifted when the chicken shawarma baos arrived. The filling was on point, taking us back to childhood memories of wolfing down fresh shawarmas under neon tubelights in old Dubai cafeterias. 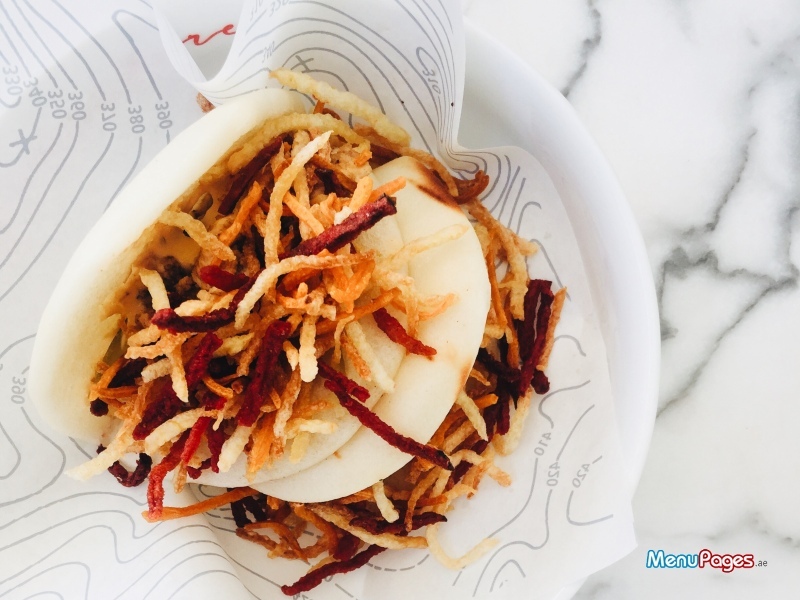 The fluffy baos were a nice touch and even made us think it suits shawarma meat better than traditional khubz. Don't tell your local shawarma dealer we said that! It wouldn't be a stroll down memory lane if there wasn't fish and rice on the table. Steaming hot fish sayadieh swam out of the kitchen with a spiced yogurt dressing on the side. 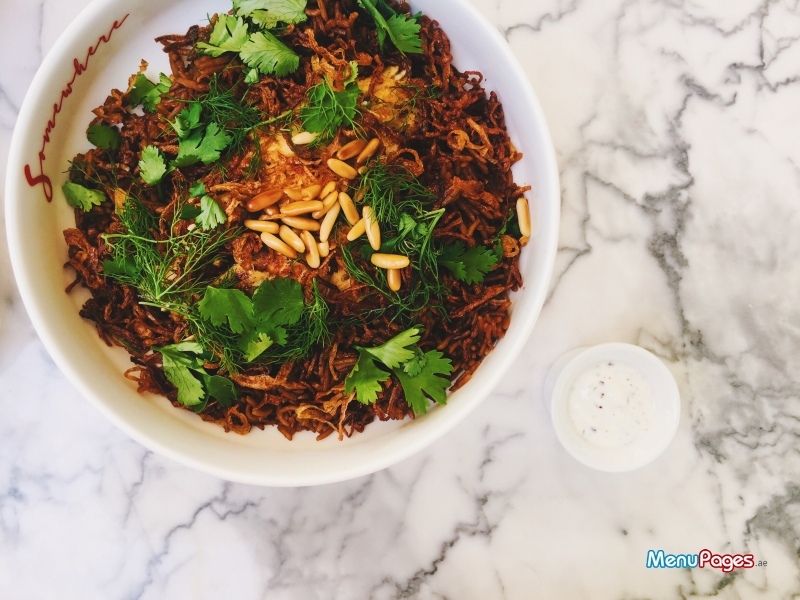 A culinary gem unique to the Middle East, don't wait until Eid for your next fix, Somewhere's seabass version is as authentic as it gets. No surprise here – the sayadieh is a crowd favorite. With no room left for dessert, we did the logical thing and ordered two whopping desserts! 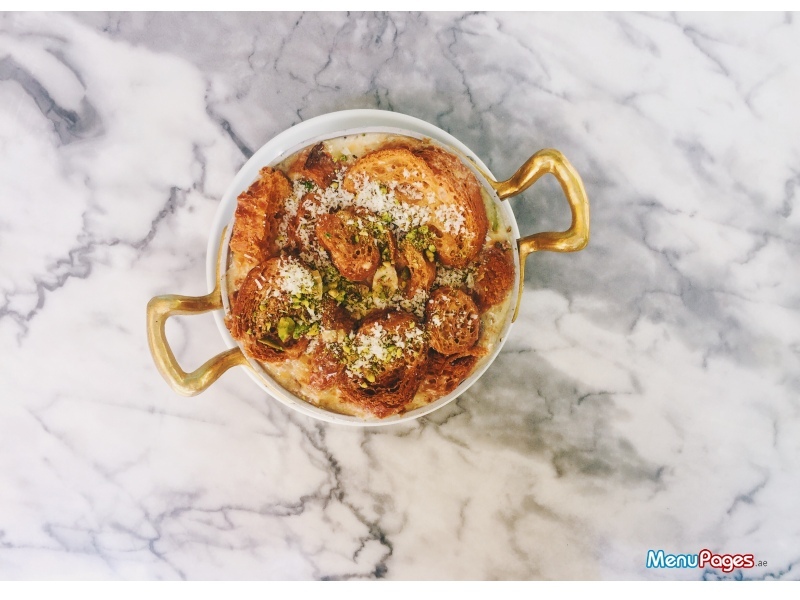 Word on the street is the karak french toast and cerelac umm ali are show-stoppers. Putting these claims to the test, we ordered them, and were in dessert heaven. While people that haven't grown up in Dubai would turn their nose up at eating a bowl of hot baby food at a sophisticated restaurant, cerelac is every Dubai kid's secret vice. 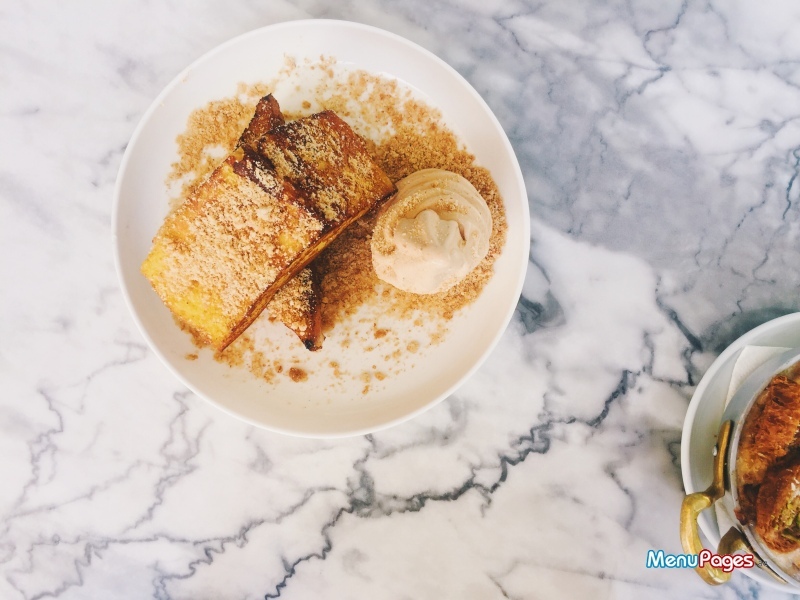 Throw karak french toast into the mix and you've got a party! This dramatic dessert isn't your typical Saturday morning brekkie. It came with a towering swirl of ice cream and a shower of karak tea. Both desserts were alive with copious amounts of nostalgia (and saffron). We battled against the carb fest with a rock-solid double espresso. Somewhere's staff read our mind and rushed to our table before we even had the chance to wave for their attention. Service is attentive, efficient and strikingly quick. The best seats in the house are unquestionably on the terrace. Surrounded by lush greenery and a priceless view of the fountains and Burj Khalifa, the terrace is accented with distressed Middle Eastern rugs contrasted by modern marble tables and chairs. Our three-course lunch for two amounted to 340 dirhams. I'd keep coming back until I've tasted everything on the menu. Jalapeno bell pepper hummus, fish sayadieh, cerelac umm ali and karak french toast.